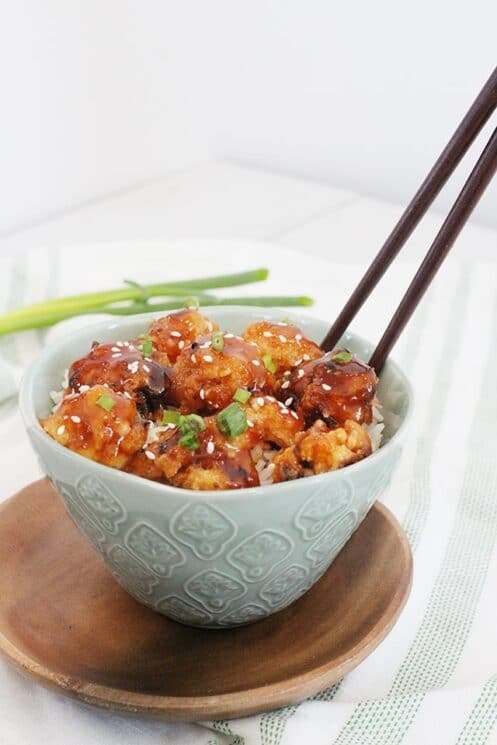 Baked cauliflower is incredibly versatile- and with this delicious sweet and sour sauce, you won’t even miss the meat! Baking your cauliflower at 425 degrees F is the perfect temperature to get a nice crispy outside while still having a tender inside. Use parchment paper to line your baking sheet for easy cleanup. Try to chop your cauliflower florets so they are a consistent size. This way they all bake evenly. After you rinse your cauliflower, make sure you dry the pieces well before baking. If you leave it wet, you will end up steaming the cauliflower and you won’t get that delicious caramelized crust. Leave space between the florets on your pan for the same reason as above. You don’t want to create moisture and steam your cauliflower. How Do You Prepare Fresh Cauliflower? The first step to preparing your cauliflower for baking is to remove the outer leaves and then slice the florets at the base where they meet the stalks. Trim any brown coloration that is on the edges. After you cut the florets off the head of the cauliflower, you can trim them down smaller into uniform pieces. The next step is to rinse and dry the cauliflower. Rinse to remove any dirt or other particles on the cauliflower and then make sure you pat or let the cauliflower air dry until all of the moisture is gone. The last step is the fun part – baking the cauliflower! Once you prepare your baking sheet, we like to toss the cauliflower in a little bit of oil. We just toss the florets in a ziploc bag with just a small amount of oil and shake it to coat all of the pieces. Spread the florets out on the baking sheet making sure they aren’t touching each other. Then bake until they are golden brown. To finish them off, we turn the oven to broil and cook for just a few minutes to really crisp up the outside. What is Better for You: Broccoli or Cauliflower? Cauliflower, broccoli, Brussels sprouts, cabbage, kale, and a few other veggies make up the cruciferous vegetable family. Cruciferous vegetables have it all: vitamins, minerals, fiber, and phytochemicals that help fight disease. One of the biggest health benefits to these veggies according to lots of research is that they may help lower your risk of cancer. To learn more about why, read this article. Back to broccoli vs. cauliflower. If you look at the individual nutrients, broccoli does win in that department. But we really believe in varying your diet – including your veggies. Cauliflower is still jam packed with nutrients and is a great choice to mix it up with your other cruciferous veggie choices. The one downside to these veggies is that they can produce a strong odor. The best thing to do to prevent this is to no overcook them. The truth is that it is hard to avoid the smell – we just embrace it and face the reality that our house might smell every other night of the week! Cook rice as directed on package. Cover and set aside. Preheat oven to 425 degrees F. Line baking sheet with foil. 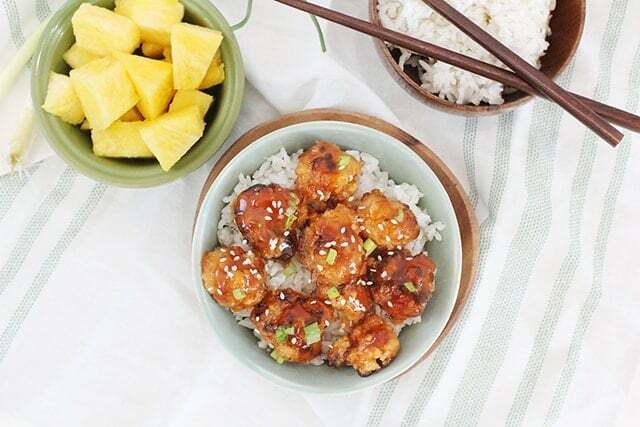 Cut cauliflower into bite-sized pieces. Add to a ziplock bag with avocado oil; shake to coat. Spread cauliflower onto lined baking sheet and bake for 15-20 minutes, until they become slightly browned. Switch oven to broil setting and continue cooking for 3-4 minutes. Add first 7 sauce ingredients to a saucepan and bring to a boil. Meanwhile, in a small bowl, whisk together the cornstarch and cold water, allowing to fully dissolve. Pour into sauce mixture, whisk together. Continue cooking until thickened, and then reduce the heat to low. 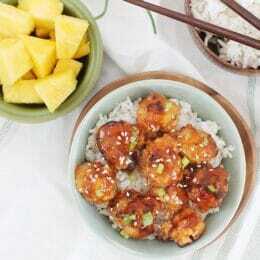 Once cauliflower is done, add to a large bowl with the sauce and toss to coat. 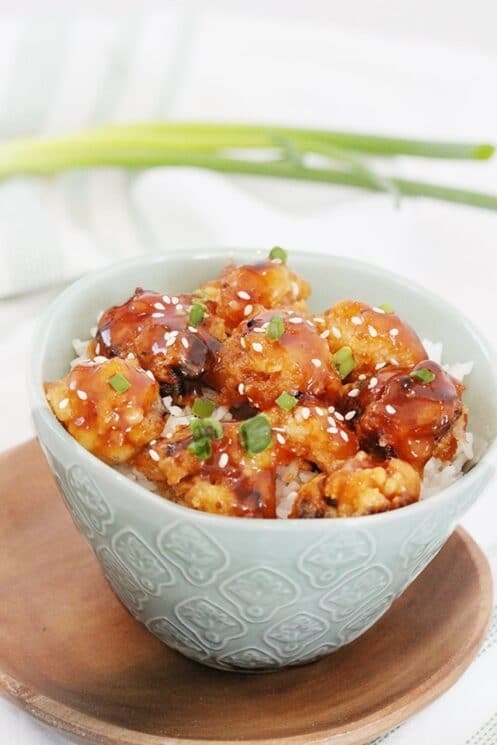 Serve cauliflower with rice, topped with sliced green onions and sesame seeds. 30 grams of sugar per serving? 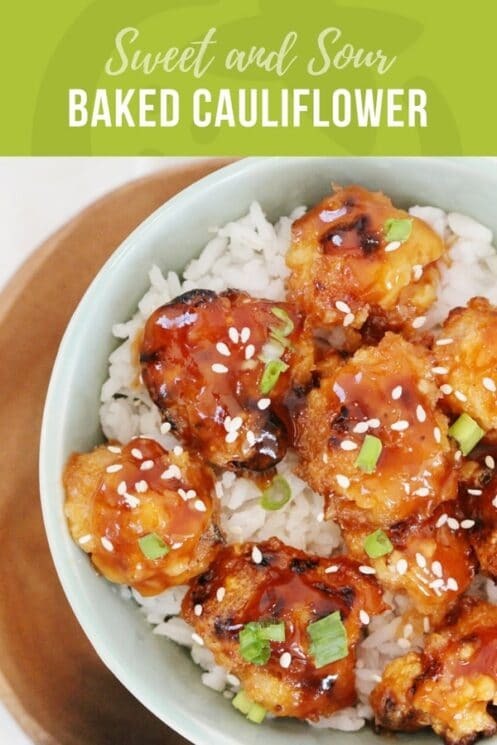 How is that possible for a cauliflower recipe? That’s over 7 teaspoons. ???? Kind of takes the ‘healthy’ part away. Bummer. I’d love to make this with snap peas, too. How would you recommend cooking them? On the same pan in the oven with the cauliflower? Thanks! This was a little too sweet. Maybe half the amount of sauce would have done. The sauce overwhelmed the cauliflower. Thanks for the feedback Deb! Fun! I used the sauce as a dip, rather than applying it to everything, and my 3-year-old enjoyed it (“NEW” dip! ).